Please don't attempt this on your own!!! Much of our repairs involve fixing someone else's badly done repairs, mostly involving straight portland cement. 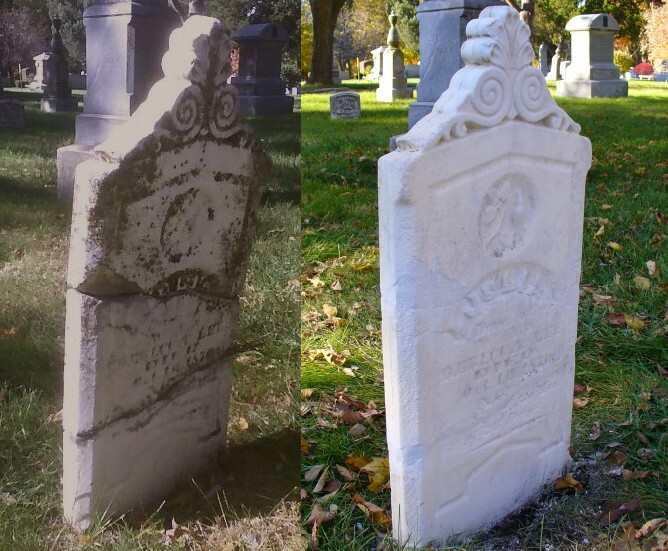 Our stonemasons are well-qualified and experienced, and have permission to repair the neglected stones in cemeteries around our area. Here are some samples of our recent work. This stone was damaged by the rod inserted in the middle to protect it! 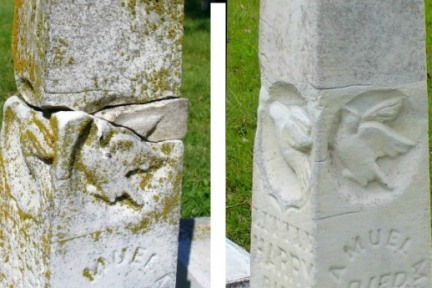 Freezing weather caused the rod to expand contract and eventually it damaged the stone. We chose not to repair the damaged dove. It had a Winged Victory look to it that we probably could not have improved upon. Also there is a question among preservationists and conservationists about repairing damaged text, as in the "Gone but not forgotten" below the date here. That may have been the client's call, or in this case the stone restoration artist. Certainly, if the name or date is damaged, it would not be repaired unless it was KNOWN TO BE ACCURATE. We only wish to save history, not re-write it. This stone was damaged when its larger neighbor was pushed into it. In this case, the artwork was restored as closely as possible to its original (weathered) state. Note the smaller cracks which we chose not to repair at this time. Perhaps in the future if they grow worse. This stone was vandalized many years ago. Some charmer kicked it right in the middle of the important information, and kicked it again when that wasn't enough, for a total of three pieces. 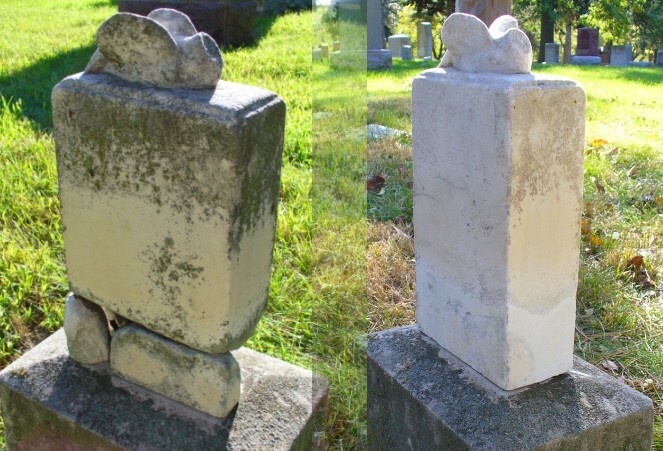 I felt it was important to repair this one because its portland cement repairs had long ago failed, and the stone is literally articulated (the thing was waving in the wind), with the inserted rods creating inner stresses that would probably have broken through the brittle marble soon, causing even more damage. This is a good example of the quandry that a stone restorer faces in terms of trying to keep as much of the historic information as possible. I was sure that the name was Julia, so I recreated a J as best I could, where most of the previous one had been destroyed. However, the AE (Age) was illegible. I believe Julia was a child because she still maintains her father's name, but we will never know from the stone. Thankfully, the information still exists in the cemetery records. 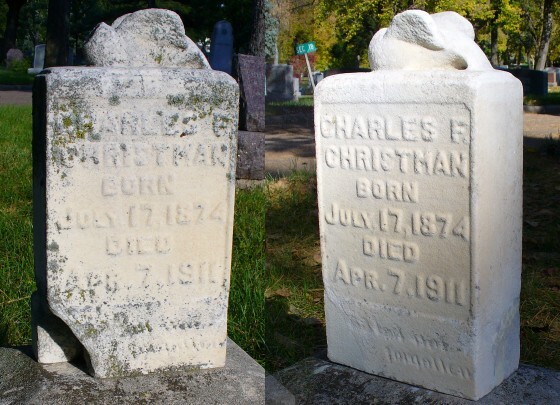 This is one of the oldest extent stones in this particular cemetery, with a death date of 1870. Nebraska only became a state in 1867. This is also a good example of the problems with many early repairs. Usually portland cement is/was used, and it mars the white marble with ugly grey that is very hard to remove. On the back of this stone, I had to chisel clear down to "bedrock" (the unsugared marble) to get all of the cement off (less than a 16th of an inch). If there is no sturdy bedrock on your stone -- perhaps it's too far gone -- just leave the cement. This is the kind of mindset that I think a stone restorer should maintain. A) Be absolutely sure that you have the skills to leave it better than you found it before you endeavor to repair it. B) Shading of mortars, perfectly crisp edges, restored art...It will never be as good as the original, but at least it's better, and safer, than it was in its damaged state. Your repair will become part of the stone's history, and as long as you leave it better than you found it, and as long as you haven't added anything arbitrary (like a signature...it's their stone, not yours), your repair will be worthy of being a part of the stone's history.